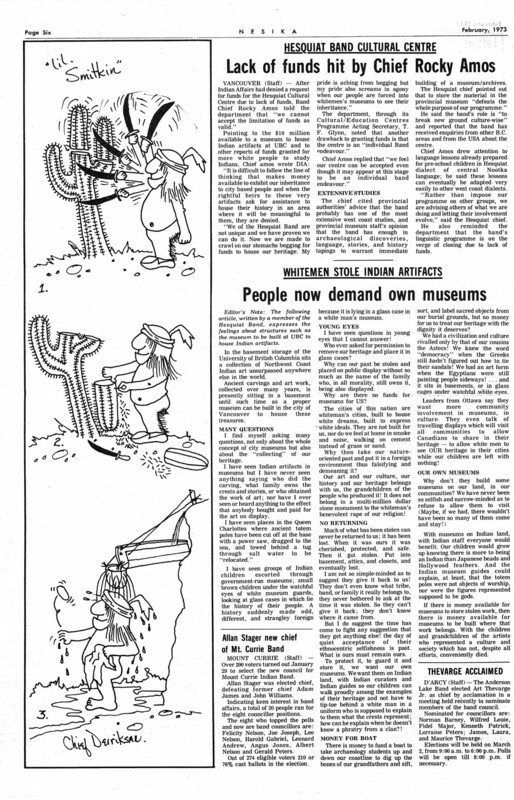 Excerpt of 1973 Nesika newsletter criticizing MOA and SFU Archaeology. Click to view full page. Scroll down this page for link to plain text. 2018 edit: It looks like Nesika is now available to browse here, and to search here. MONEY FOR BOAT: There is money to fund a boat to take archaeology students up and down our coastline to dig up the bones of our grandfathers and sift, sort, and label sacred objects from our burial grounds, but no money for us to treat our heritage with the dignity it. deserves? 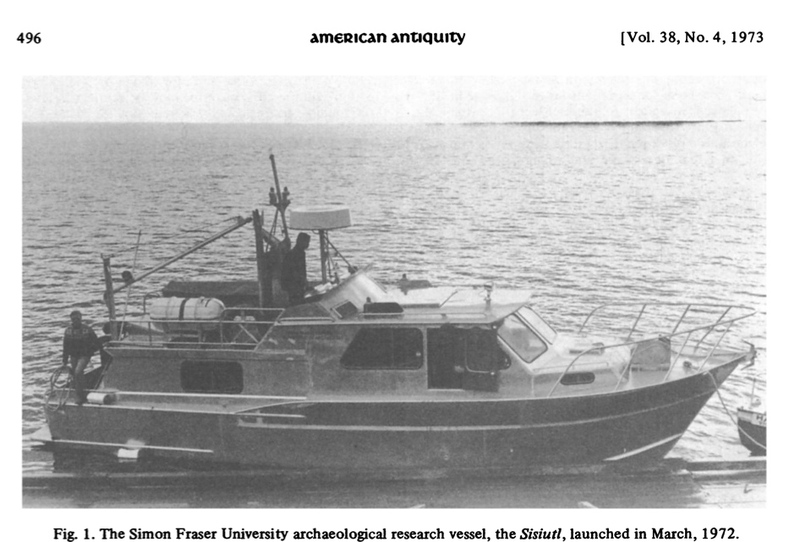 This can only refer to the former pride and joy of the SFU department of Archaeology, the motor vessel Sisiutl. That page from Nesika has two interesting articles. One argues for the creation of a Cultural Centre at Hesquiat, while the other passionately objects to the millions spent on the UBC Museum of Anthropology and the above-mentioned Sisiutl. Click on the image above for a legible image of the entire text, or click here for a transcript. It is chastening to see the eloquence and power of these arguments from almost 40 years ago. Hesquiat still has no Cultural Centre so far as I know while the Museum of Anthropology just wrapped up a 60+ million dollar renovation and SFU Archaeology has what amounts to their own, brand-new building as well, at what I hear was a cost of about 5 million dollars. If there is money available for museums to store stolen work, then there is money available for museums to be built where that work belongs. With the children and grandchildren of the artists who represented a culture and society which has not, despite all efforts, conveniently died. First custom built archaeology research vessel in North America: The Sisiutl. Recently scrapped by SFU. Source: American Antiquity. PS: kudos to the Union of BC Indian Chiefs for putting so much archival information online. In related news, I previously linked to the archives of the Native Voice, which is another great resource for understanding First Nations politics and which also contains intriguing aboriginal perspectives on the practice of BC Archaeology. This entry was posted in anthropology, Archaeology, archives, Cultural Resource Management, First Nations, history, Northwest Coast, Vancouver Island and tagged anthropology, Archaeology, Hesquiaht, Hesquiat, MOA, Museum of Anthropology, museums, SFU, Sisiutl, ubc, ubcic. Bookmark the permalink.